There is a story behind each of us that probably includes at least one teacher. For me it was a choir teacher named Robert Salvatore Ruberto (1932-2016). He patiently filled my head with music, dreams, poetry, wisdom, laughter, encouragement and discipline. In addition to the thousands he conducted in his choirs over the years, he personally mentored and counseled hundreds of us through every conceivable crisis. While he was alive, he wasn't interested in honors saying: "I've been honored enough, the joy is in the journey and in my students." Although I have thanked him on 17 movie soundtracks, a new Sony Masterworks soundtrack called Max and Me (featured on New Classical Tracks), recorded at Abbey Road Studios with 135 of London's finest symphonic and choral musicians, along with concert violinist Joshua Bell, is solely dedicated to this public school teacher's memory. In high school, I spent every free minute practicing piano and organ in Robert's tiny office. How he endured bad Elton John, Beethoven, and my early noodling compositions day after day is a mystery. After playing a piano-organ solo in front of a large audience in my small hometown, I pushed Robert's upright piano back in order to perform an encore. As I pushed, the tall piano got snagged on a crack in the old high school wooden stage and began to tip backward in slow motion. I frantically grabbed trying to hold the 700-pound piano up but to no effect. It slammed flat on its back with the loudest crash I've ever heard. The audience stunned, I stood paralyzed thinking, "I've just destroyed Robert's only piano in front of my entire community, and he will be livid." I desperately wanted to be beamed out like Captain Kirk. Shielding my eyes from the glaring spotlight, I searched for Robert. When I finally found him, what I found were deeply loving eyes and a smile. He stood up and asked for strong men in the audience to lift the piano back up. He said loudly. "It's fine. … Go ahead and play." That was his lifelong message to each of his students: Don't ever let anything stop you. Fearlessly use your gift, and do what you are called to do. Don't stop. Don't ever give up  ever. Robert's dream was to be an Italian opera star. Instead, he came to a small Minnesota town, Lake City, raised a fine family and turned the community upside down introducing rebellious young people involved in alcohol and drugs to pursue meaning through the language of great music and great love. He used Bach, Brahms, Beethoven, the Beatles and Leonard Bernstein's difficult masterpiece Mass. We now know that music encourages strong left and right hemisphere crossover, which is the magic in high functioning brains. With Robert, that magic was exceptionally pronounced because he added love, acceptance and hope to young people struggling with romance, deceased parents, depression, drugs and school. He said, "I chose to teach music in high school because the young minds there are still pliable." His students over the years became doctors, teachers, nurses, lawyers, professors, scientists, pastors, Wall Street analysts, philosophers, business leaders, musicians and politicians. Several weeks before he unexpectedly passed, I sent him my Sony Masterworks soundtrack Max and Me. Not one to give unmerited praise, I braced myself. He approved. Relieved, I timidly told him I was dedicating it to him. He responded, "What does that mean?" 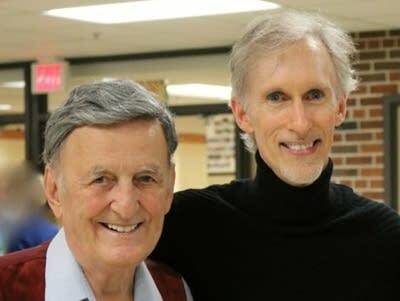 Well maybe not much really  only that his spirit and artistry live in this music, and that I desire to honor this generous teacher because he made all the difference. Like many, Robert was there early when there was not much to believe in. "I have no mentor; I'm my own man" a famous composer said recently. I'm not sure that is possible because every life influences every life around them, especially teachers. Our public school teachers and private school teachers are on the front lines helping bring out the best in future generations. They are the ones helping the next generation in their most formative years become all they possibly can be. Maybe there is an email, letter, phone call, post, tweet or text that you might send on the next Teacher Appreciation Week?